A team of researchers in the U.K. has found that the human eye and brain are together capable of seeing "ghosted" images. The researchers have published a paper describing their work on the arXiv preprint server. Physicists have found that it is possible to create ghost images with a technique using light to make an image without reflecting it off the original object. The technique is called "ghosting," and is of interest to optics research. It involves lighting an object with a structured light field and recording the light that is reflected off the object with a bucket detector. Meanwhile, a second light field is modulated using a predesigned pattern and is projected onto a detector. The detector records and integrates the light to create an image. 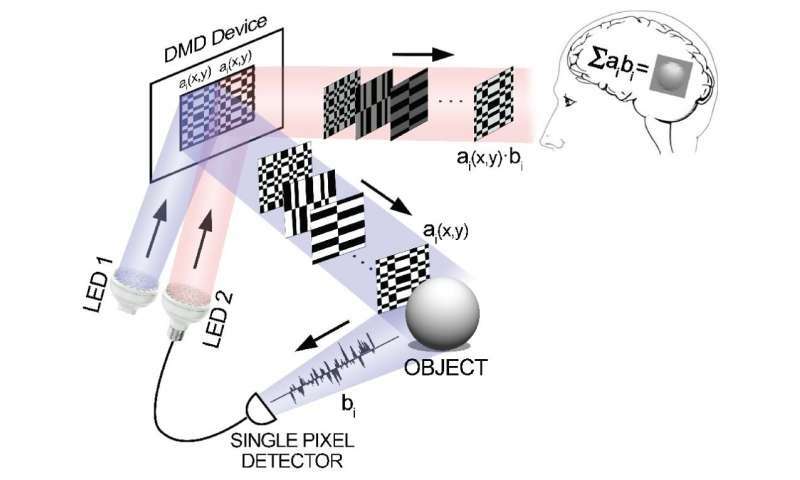 In this new effort, the researchers found that the human eye and brain can work together to perform the function of the second detector, and in so doing, can see an image created by photons that never actually touched the original object. The experiment was conducted as usual, but instead of using the spatially resolved detector, a human being was positioned to look at the screen where the light was being projected. The human volunteers were exposed to random bits of light which, when combined together over time, formed an image—in the experiments, the image was the famous photograph of Albert Einstein sticking out his tongue. To find out if such an arrangement could work, the volunteers were situated in such a way as to allow them to adjust the pacing of the patterns projected onto a screen in front of them. The researchers report that the pacing of the projections started out slowly, but as each of the volunteers used a device to speed up the time between each display, they eventually came to a point that they could make out the image—at 20 kilohertz. They further report that their experiments demonstrate an entirely new form of human visual phenomenon, and because of that, opens a new field of optical study. Computational ghost imaging relies on the decomposition of an image into patterns that are summed together with weights that measure the overlap of each pattern with the scene being imaged. These tasks rely on a computer. Here we demonstrate that the computational integration can be performed directly with the human eye. We use this human ghost imaging technique to evaluate the temporal response of the eye and establish the image persistence time to be around 20 ms followed by a further 20 ms exponential decay. These persistence times are in agreement with previous studies but can now potentially be extended to include a more precise characterisation of visual stimuli and provide a new experimental tool for the study of visual perception.